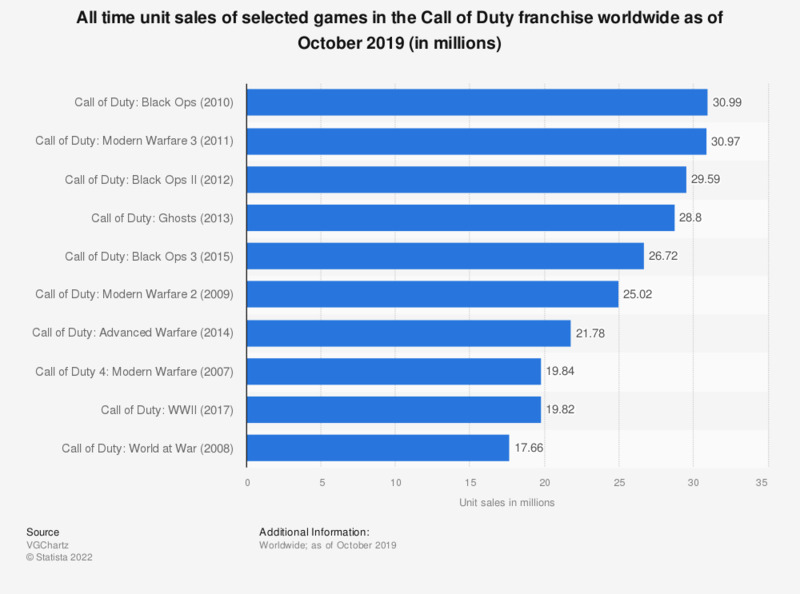 The graph shows data on all time global unit sales of selected games in Call of Duty franchise as of February 2019. As of the measured period, the Modern Warfare 3 edition of CoD was the highest-seller in the franchise, with 30.71 million units sold worldwide since its release in 2011. The figures includes sales of Xbox 360, PS3, PS4, Wii U, Wii, and PC versions. Published by Activision, Call of Duty (CoD) is a popular first person shooter video game series which first launched in 2004. While the franchise was originally created exclusively for Windows, later versions were made available for numerous other platforms, including Xbox, PlayStation, Nintendo, and OS X and more. The plot of the game revolves around war – WWII in case of Call of Duty 1,2 and 3; an imagined Russian civil war for Modern Warfare 2; and a near-future war setting for Black Ops II and several subsequent releases. The latest installment in the franchise, Call of Duty: Black Ops III, was one of the most successful projects for the developer and the publisher. The game was the most highly anticipated PlayStation 4 title of 2015. Consequently, Black Ops III secured the first spot on a ranking of PS4 best-selling video games that year, with nearly 11 million copies sold. Additionally, Call of Duty sales on Xbox One amounted to 6 million units in the same period, also making it the bestseller on Microsoft’s platform. What is more, Activision announced that CoD: Black Ops III generated 550 million U.S. dollars in revenue in mere 72 hours after its release on November 6, 2015. Are you going to buy the video game Call Of Duty: Infinite Warfare?